Welcome to DivaTalkRadio. Our weekly shows are dedicated to the 50+ woman who is navigating through the second part of life with purpose and on purpose! She's raised her family, has had success in business/career, and now is looking for ways to make a greater impact on her community and throughout the world. She is intentional and enjoys living the blessed life! 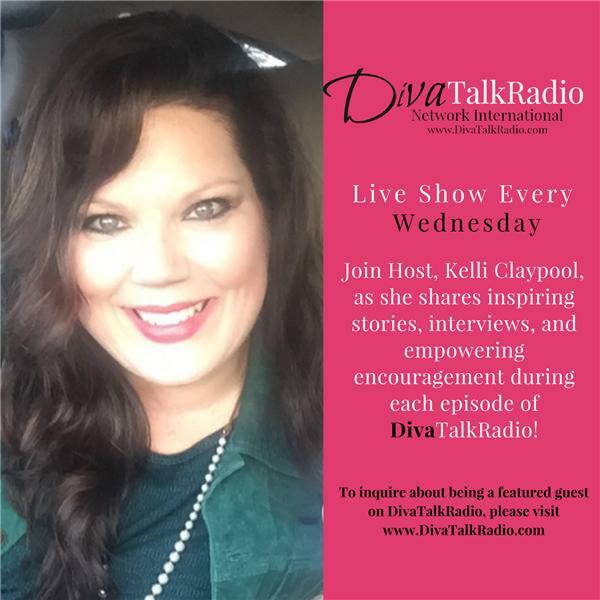 Join our Host, Kelli Claypool, as she empowers, motivates, and encourages you to take the leap into living life with outrageous expectation and joy! So slip on your favorite pair of stilettos and join us! Plan to laugh, cry, and walk away inspired! What Makes a Happy Couple Happy? Whether you're in love and want to make it better, or are alone and want to get it right next time, relationship expert Kim Olver reveals the hidden truths behind happiness and satisfaction. Secrets of Happy Couples is different from other books of the same subject because it is based on one basic truth—that all great relationships begin and end with yourself. Any relationship is the sum of its parts: individuals. This book explores how you, as an individual, can make the difference and create a happy and fulfilling relationship with your partner. No other book has surveyed couples. Olver also interviewed prominent relationship experts and included their ideas in the book. She discusses the Relationship Cycle, beginning in the Alone Stage, moving to the Getting Together Stage, on to the Compatibility Stage, to the Maintenance Stage, and then back to the Alone Stage. At least 50% of us will find ourselves alone again due to death, divorce or personal decision. Kim doesn't shy away from that fact; instead she provides tips and strategies to successfully navigate the grief of a lost relationship. Secrets of Happy Couples: Loving Yourself, Your Partner, and Your Life will provide you with the answer to how you too can be happy and satisfied in your relationship with your significant other. Join our host, Kelli Claypool, as she talks with Kim about the Secrets of Happy Couples. Struggling to figure out what you want to do with the rest of your life? What does natural health mean to women? Online College Courses – Are They For You?